Location: Kanchipuram near Kanchipuram . Description: This is a small shrine in Pillayarpalayam in Kanchipuram, which is home to the grand Ekambareswarar Temple Shivastalam. The image above is that of Somaskandar at the Ekambreswarar temple. There is a temple in honor of Sambandar (Aaludaiyapillai) here, and hence the name Pillayarpalayam, although none of Sambandar's Patikams in honor of this shrine are presently available. This is the 2nd of the 32 Tevara Stalams in the Tondai region of South India. Legend has it that Vishnu meditated upon Shiva here to attain Shivaroopam. 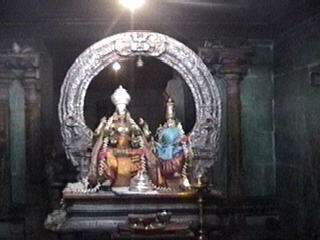 The Temple: There are 2 other Shivalingams in this shrine Odha Urigeeswarar and Mutheeswarar. The Sambandar festival is conducted each year here. The temple has a three tiered Rajagopuram. The Metralinathar shrine faces west. There is a shrine to Kamakshi although it is believed to be of later origin. Festivities pertaining to the Kachabeswarar temple in Kanchipuram are linked with this temple. There are also shrines to Ganesha, Subramanya, Kasi Viswanathar, Bhairavar and others. Oda Urugeeswarar shrine is an east facing one. Please see the Ekambareswarar Temple for more information on Kanchipuram.